have claimed that it is a Photoshop job. 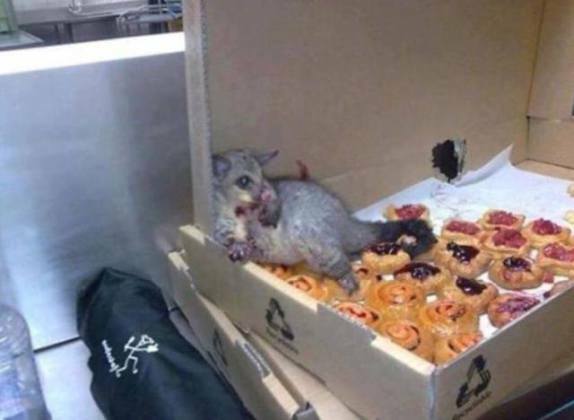 The kerfuffle may have started with a number of people who didn't believe that is was a possum. These people tended to be Americans who didn't realize that there is a difference between the American opossum and the Australian possum. The possum is named for the opossum, but they are different animals. The name comes from the Algonquin language. The photo was originally posted on Twitter by a user in Sydney and went viral almost immediately. The newspaper that originally received the photo, the Hornsby Advocate, confirmed that they received it from a reader and could not vouch for its authenticity. It could be authentic. Weirder things have happened. You wouldn't need to call animal control and the press if he couldn't move. You could just dump him back outside -- and plug up his point of entry. Then again it could also be a fake that someone came up with. The real point is -- does it matter? The photo is cute and funny and brought smiles to many people. Whether or not he really tried to eat his way through a box of pastry, he is still one cute little critter. Personally -- I want to believe. Happy Owl -- Cute Animal Video of the Day!!!!! We All Know That Dogs are Smart, Right? The Animal Video of the Day!! !